We now know the full plan of what to expect from Friday the 13th: The Game in the upcoming months. Gun Media and IllFonic detailed upcoming plans, and revealed that the single-player content will consist of both offline bots and challenges. Before that happens though, the game will be getting the following updates in the Fall: Free Emote Pack, Spring Break 1984 Pack, Part IV Jason, Jarvis House Map, New Counselors, New Kills, New Clothing, Virtual Cabin 2.0. Afterwards the offline bots and a demo of the challenges will be released. 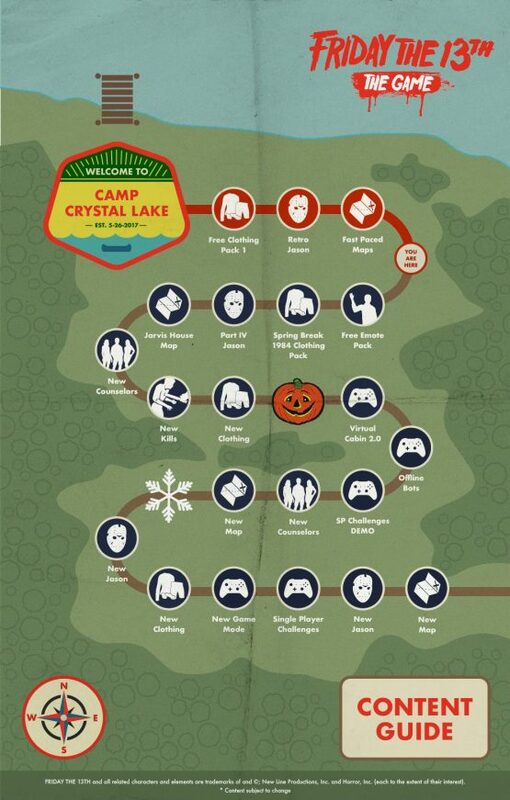 Then during Winter, players will see new counselors added, two new Jasons, two new maps, new clothing, an unannounced new game mode, and the complete single player challenges. I also want to address the misconception that certain content we launch affects single player. It doesn’t. An artist working on outfits is not the same person that is programming AI. The designer setting up scripted events for single player is not making the new Jason models. What does impact Single Player are the bugs and stability issues; that AI programmer may have to shift to fixing a bug occasionally. The designer may have to shift to fix balance or gameplay bugs on maps. This is why we are delayed. We made the decision to fix rather than add new stuff which again, is what caused the delay. Friday the 13th: The Game is available now.